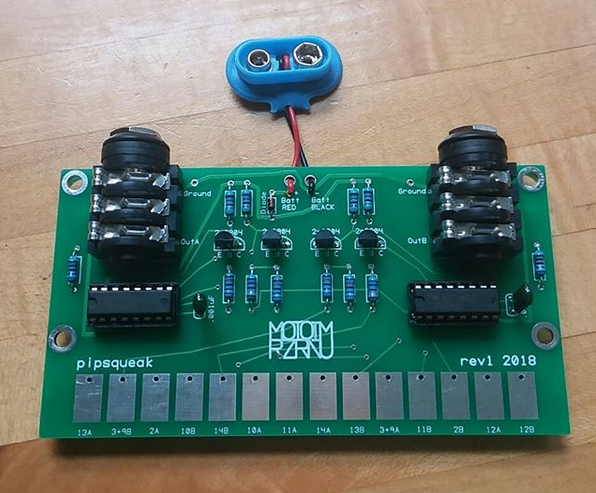 The Pipsqueak is a portable touch-controlled noisy synthesizer by Mroztronium. Spiritually inspired by the Cracklebox, Bugbrand Weevil and other touch-controlled electronic instruments, but using a unique circuit developed by Mroztronium that is designed for unpredictable results, wide frequency range (from sub-audio to above human hearing), sensitive touch control and stereo operation. It features a pair of outputs that emit rectangle waves, complex pulse trains, triggers or complex noisy waveforms in the region of 0-9V depending on how it is touched. In addition to listening to the raw stereo output, you can also use it as a complex controller to gate/trigger and frequency modulate external CV/Gate equipment. It is an interesting way to spice up a modular synth patch or to turn an otherwise predictable synthesizer into a freakish improvisational instrument. The workshop will be suitable for beginners and requires no knowledge of electronics. We'll cover soldering too.